My love for hummus began in college. There was a place called Roly Poly that had the most amazing wraps. It went out of business and I never saw another one till I was in Dallas. It had been 8 years but I went right up to the counter and asked for a 'Number 6'- the California Hummer- Roasted Red Pepper Hummus, Provolone Cheese, Lettuce, Tomato, Avocado, Carrot, Cucumber, Green Pepper, Sprouts, Creamy Caesar Dressing. AMAZING! 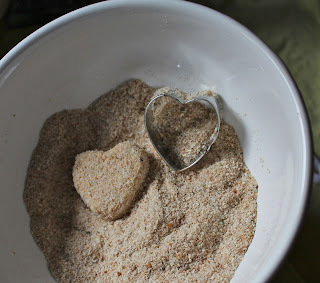 Since then, I've enjoyed trying different kinds and just loved the idea and simplicity of this recipe. I hope you enjoy it as much as we do! I doubled the recipe because I wanted to share with the girl who pointed me to the recipe. This made a ton! 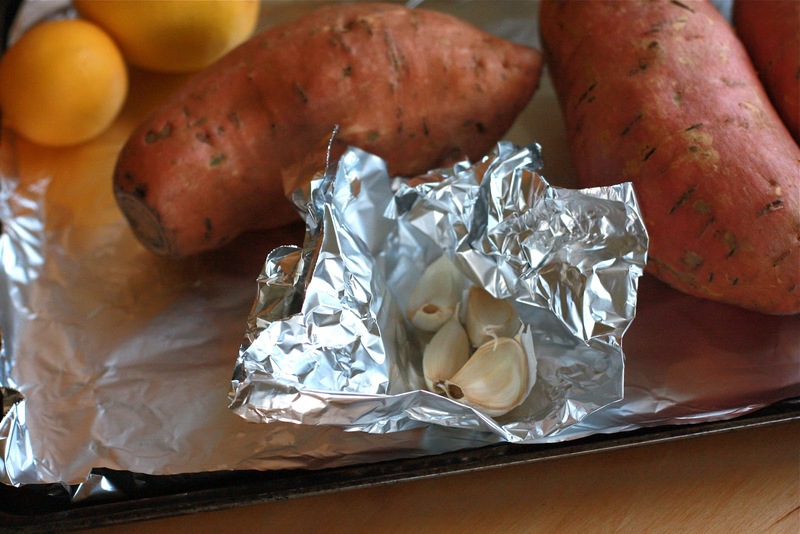 Wash the potatoes and wrap in foil. Bake at 375 degrees for about an hour. With about 20 minutes left, throw in the garlic wrapped in foil, drizzled with olive oil. Remove everything from the oven and let cool for 20 minutes or so. Peel the potatoes with some tongs. Combine the potatoes, garlic, and the remaining ingredients (not paprika) in a food processor or in a bowl, using an immersion blender and blend till smooth. Garnish with paprika and serve warm or cold with veggies and pita chips! I love sugar snap peas, cucumber, bell peppers, and carrots with this. It's perfectly sweet and savory. Enjoy! Lauren's hummus is creamy, garlicky, and delicious! I will be posting what we eat this week. I'll post pictures and recipes when I can. And at the end of the week, I will post a meal plan that includes a grocery list for all of the recipes I made this week - a little something for you to look forward to! 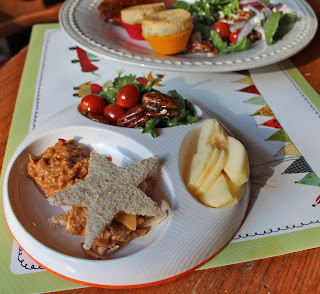 Dinner - BBQ Chicken Sandwiches, Gluten-Free Brazilian Cheese Bread (another Gluten-free fail that I don't want to talk about), sliced apples & salad. About the dinner: this recipe for crock pot BBQ chicken is one of my favorites, and only has 5 ingredients. I usually make 6 chicken breasts and freeze the leftovers for 1 or 2 other meals. For WP, I served his BBQ chicken mixed with a little sour cream and cheese on regular, toasted bread. For grown ups, I prefer to serve on Orrowheat's Whole Wheat buns with purple onions. The salad was really good. It had purple onions, feta cheese, cherry tomatoes, candied pecans (I had some in the freezer... they were a Christmas gift!) and Ken's Steakhouse Greek Dressing. My husband is sweet, smart, and super talented. 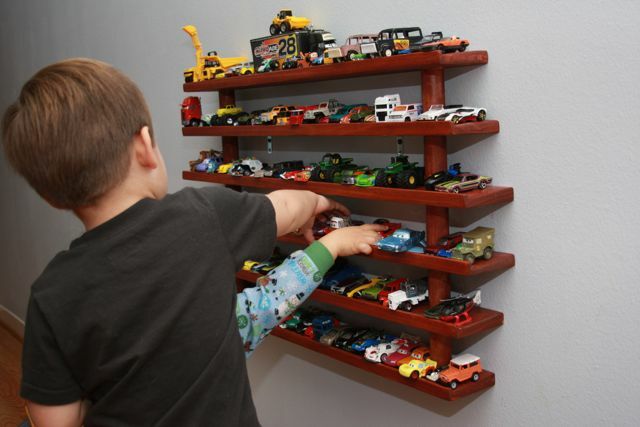 You saw the car shelf and here is another project he threw together. I saw this on ohdeedoh.com a long time ago and always thought it was a great idea. 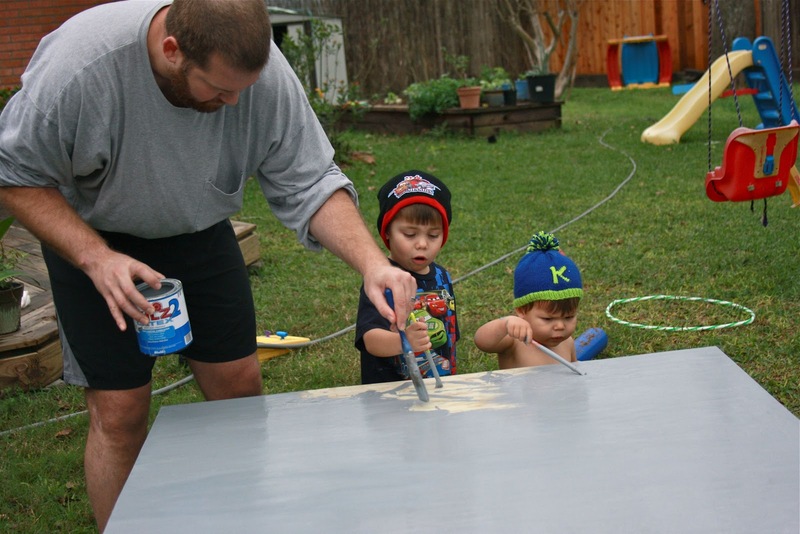 When Pinterest came along, I added it to my "please build" board and here you go. You get a 4x8 piece of pressure-treated plywood. 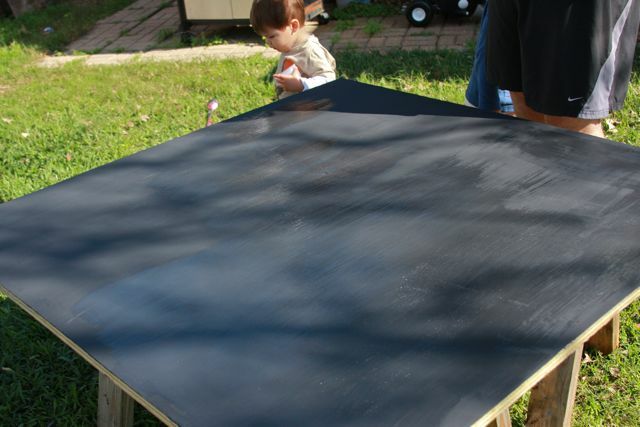 Prime it with Kilz (you can ask the mixing counter to add some black for dark paint Kilz). Let it dry completely. 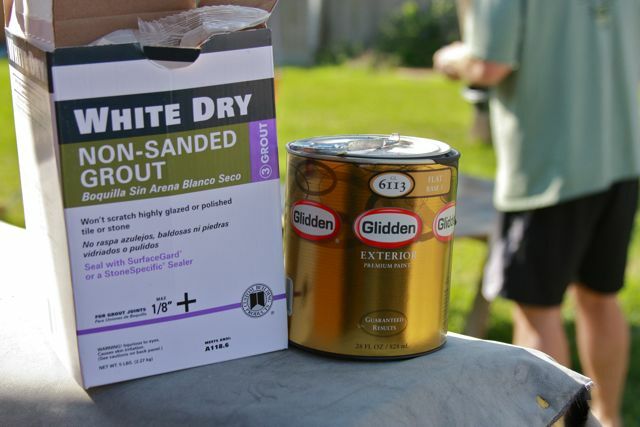 Then combine 3-4 parts of outdoor latex paint with 1 part non-sanded grout. Give it one great coat or two coats. It dries quickly. You could stop there or get creative like my hubby did. 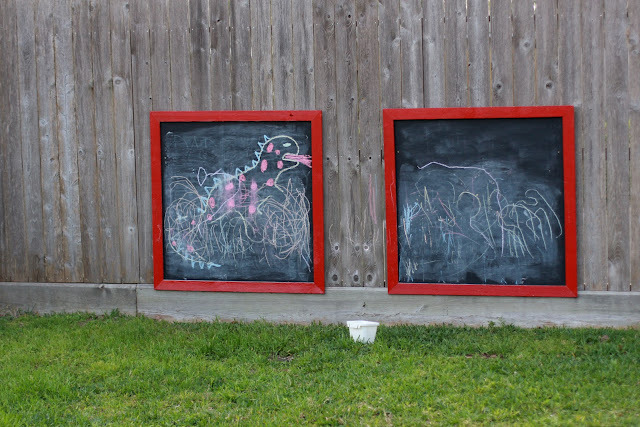 He had cut the wood into two 4x4 pieces then used a high gloss red to make frames. It was a little hard to erase at first. Just take a large piece of white chalk on its side and color the whole board. Then erase and start all over. I only have to do it after it gets wet. I like to take turns drawing and coloring one thing with KD (see the 'dragon' in the first picture). 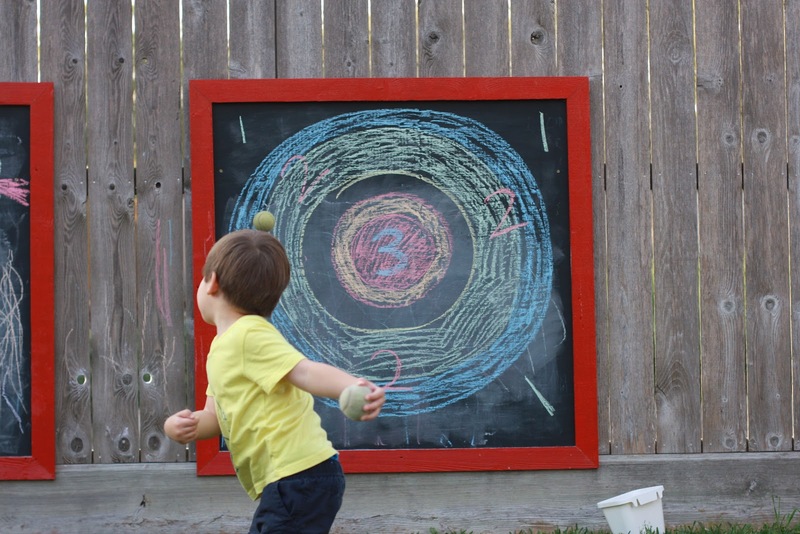 Here, I made a bullseye for them to throw balls at. Loads of fun! 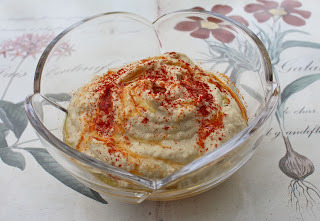 Hummus: topped with a drizzle of olive oil and a dash of paprika. I didn't do a great job of getting this hummus (pictured) really smooth. If you prefer a really, really smooth texture, just keep the food processor running for a bit longer. This hummus recipe is a staple in our house: I make it almost weekly and it keeps well for several days in the refrigerator. 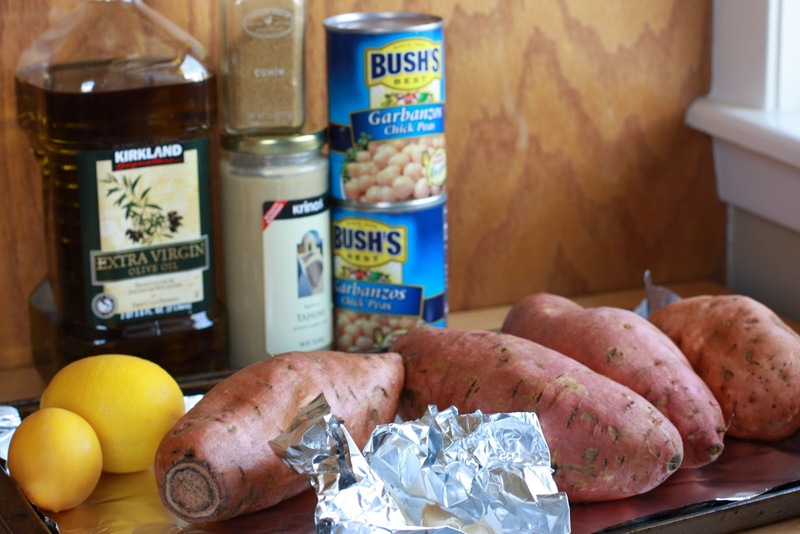 One of my favorite things about it is that all of the ingredients are now staples in my pantry, so I can make it any time. I had never bought Tahini (sesame paste) before I started making hummus, so it's a new "staple" for me. Never bought Tahini? Look for it on the ethnic aisle of your grocery store. I buy the Ziyad brand found in the Mediterranean/Middle Eastern food section. One jar lasts a long time! I really encourage you to make your own hummus if you have never tried it. To me, this homemade version tastes far better than any store-bought (and even many restaurant versions) that I've tried. I LOVE Greek food and have some yummy recipes for falafel and tabouleh that I will try to post soon. 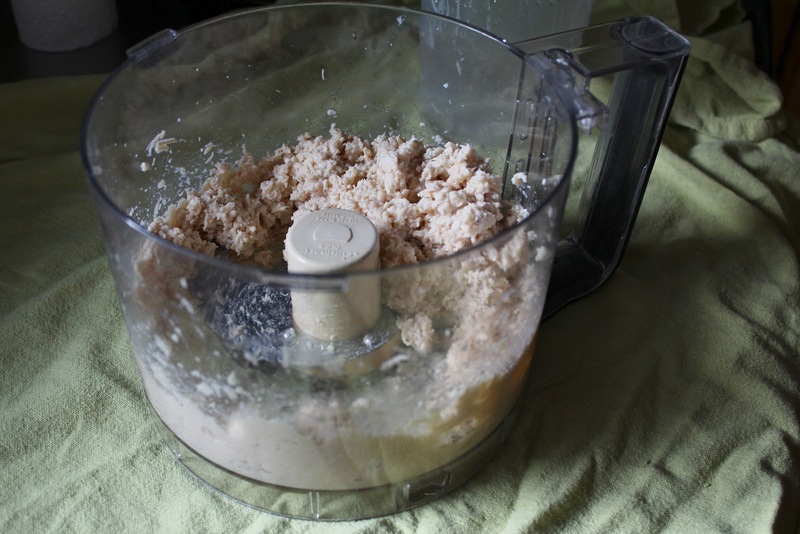 Add chickpeas, tahini, crushed garlic, lemon juice and salt to a food processor. Pulse for about a minute, until the chickpeas are smooth, stopping to scrape down the sides if needed. With the food processor running, slowly add the boiling water, 1 tablespoon at a time, until the hummus gets to desired consistency. Continue to pulse for a minute or so more until the hummus is smooth and creamy. 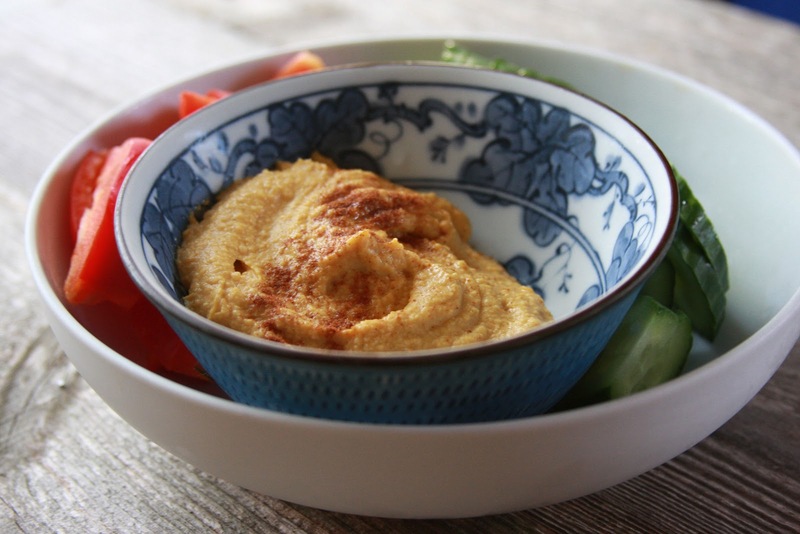 Scoop hummus into a serving bowl and top with a drizzle of olive oil and a dash of paprika. Serve with fresh veggies and/or pita chips. Williams Sonoma has a neat little 'kids' section of the store with lots of tools that make food and cooking very kid-friendly. 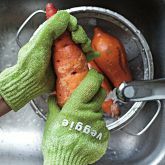 I recently got the mini/kid version of these veggie scrubbing gloves so that WP can help me wash veggies! FYI - I am not paid by Williams Sonoma to say any of this... I just thought our readers would like to know! I made Gluten Free Beet Cupcakes, and they were terrible. Really terrible. I was actually disappointed because I had very high hopes for them. 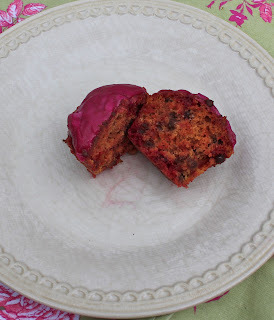 What causes an other-wise-sane person to think Gluten Free Beet Cupcakes would be tasty? Maybe it was the stunning pictures of Aran's Gluten-Free Beet Poppyseed Muffins on Cannelle et Vanille. How could something so pretty taste so bad?! Maybe it was these delicious looking Beet Almond Cookies from Cookie Underground (they supposedly taste great too!) Maybe it's because I recently had lunch with my sweet friend Celani of Melanger... and I was hoping some of her baking skills rubbed off on me, allowing me to turn gluten-free flour mix and beets into cupcake goodness. For the record, I was wrong on all above accounts. I made up the recipe for the really terrible cupcakes... so I'm only insulting myself here. I honestly think this was the worst thing I ever made (even though the icing was a pretty color!) And I will never share the recipe. Just know, KidEats readers, that for every good recipe we deem worthy of posting on the blog, there are 3 or 4 bad recipes that didn't make the cut. Like Gluten Free Beet Cupcakes. Blech. From now on, I will leave the beet-baking to more talented bakers! 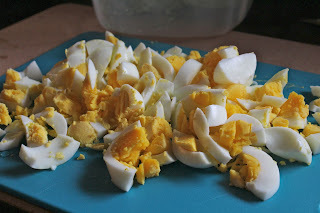 I only learned that WP liked egg salad when he helped me make it one day, and couldn't stop sneaking bites of it. Normally, I don't think egg salad is a big hit with kids. But this isn't something I make 'especially for kids'. This is something I make for ME. All for myself. 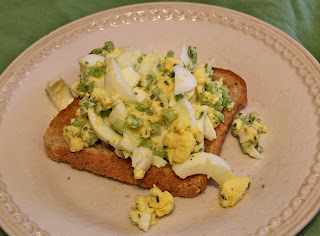 I first found the recipe for "Egg Salad Sandwich: the only one I'll eat" on 101 Cookbooks right after William was born. I was craving egg salad, and I don't even know that I'd ever had it. But I knew I wanted it. Maybe all I really wanted a small sense of normalcy... and egg salad seemed normal. You know, like something you could order in a cute cafe at lunch with girl friends. 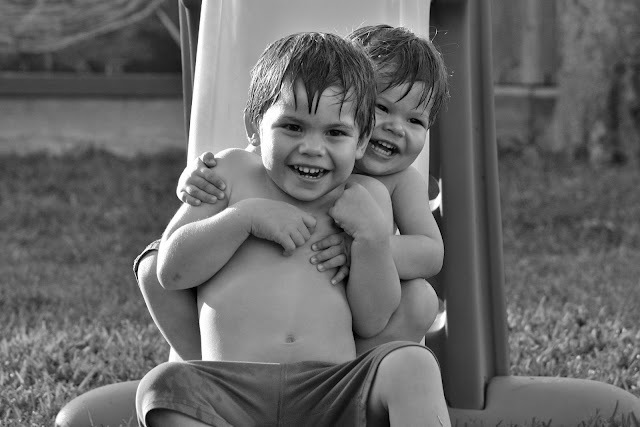 The normal that existed before the bleary-eyed newborn days at home. So, for that reason, this egg salad is a sense of normalcy for me. Every once and a while, I make it for myself for lunch, and it feels like such a grown-up treat! If you are a stay-at-home mom, make this for yourself and enjoy your lunch! 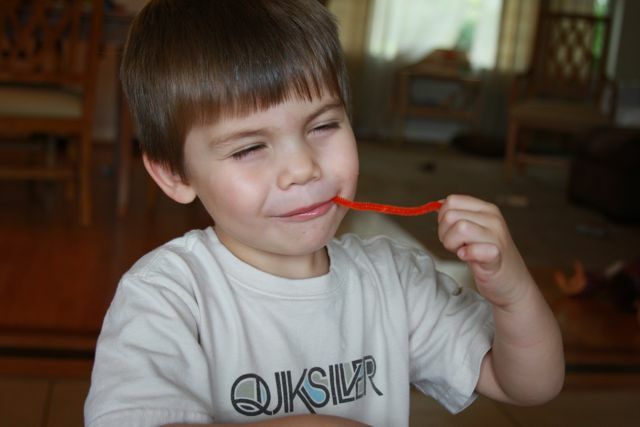 Give some to your kiddos to try too, but if they don't like it - no big deal. You made it for yourself anyways! And if you are a working mom, make this the night before and take it for lunch. It gets even better after it's been refrigerated. 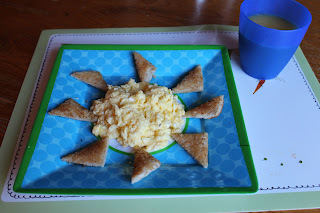 As a bonus: if your kid does like this egg salad, it's VERY nice to add to the lunch rotation and have a break from the usual! After the seven minutes, immerse the eggs in a bowl of ice-cold water for THREE minutes to stop the cooking. Peel the eggs. I like to peel mine under cold, running water. Coarsely chop the eggs, then add them to the celery/green onion/ mayo mixture and toss lightly to coat. 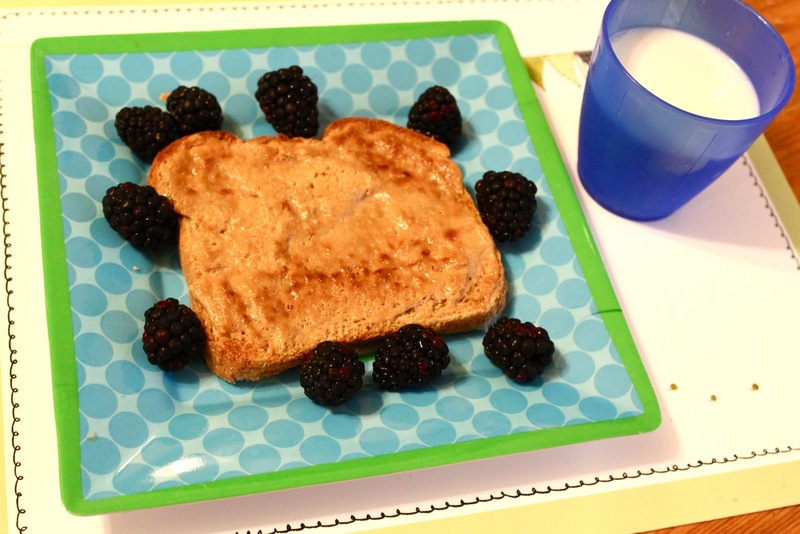 Serve on a slice of whole wheat toast, on top of salad greens, or with avocado slices. the "seven minute" method is GREAT! This what I get when I say "Smile!" It took a stern voice to get them to turn away from the shelves! My husband is very crafty. 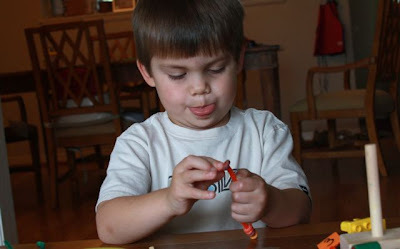 He loves working with wood and can look at something he likes and figure out a way to make it. On Pinterest, I have a board named 'Please Build Chris.' This car shelf was one of the first things on that board. My DH came up with a simpler design that works great for our boys. 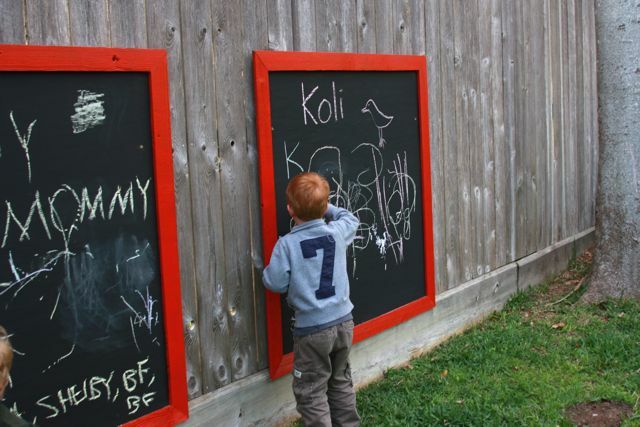 I have asked him to write something here but I don't think that's going to happen! We have ledges from Ikea holding books and I think that you could definitely use those and get the same effect. My husband did saw and sand into the ledge to have the cars come down at a slight angle but you may be able to rig a ledge in the same way. 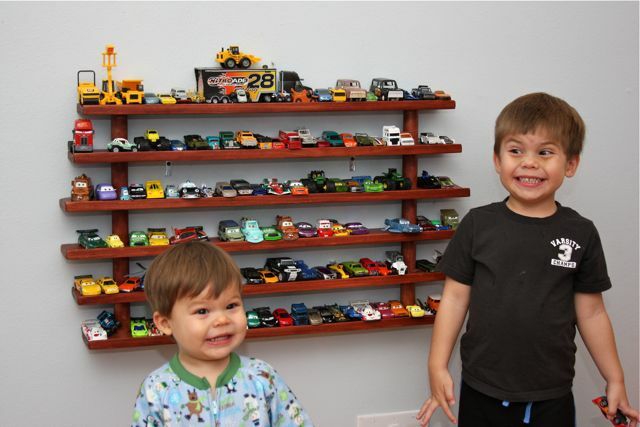 We hung it a tot level so they can spend as much time as they want taking the cars off and putting them back on. We also left space above for this shelf. My DH has been busy and I just had to share- I'll post another one of his creations soon. to make everything warm and crispy. Mmmm. I was really encouraged by the amount of nutrition this simple little meal provides! 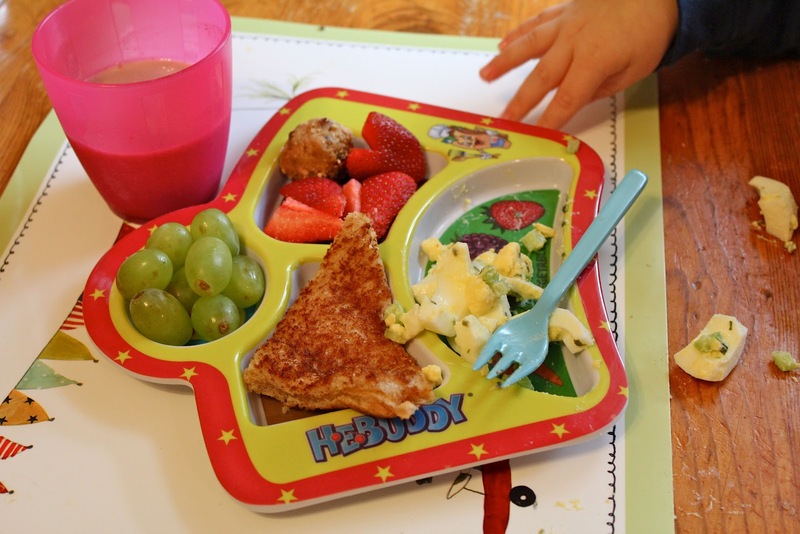 These stats came from this article on BabyCenter which contains lots of great ideas for getting your toddler to eat healthier. Get more sleep. I am a better mom, and more apt to exercise and eat better if I'm rested so this one is key! Their main tip is to shut down technology because the light from the devices delays the release of melatonin- a hormone that makes us sleepy. Eat more mindfully. Eat when your hungry, slowly and without distraction; stop before you're full. Snack smarter. Keep wholesome treats on hand- fruits, veggies, nuts, yogurt. Be grateful. A study showed that people who were coached to be appreciative showed a 23% decrease in cortisol. Cortisol is a stress hormone and weakens your immune system, dehydrates you, reduces collagen (wrinkles! ), reduces bone formation and much more! They suggest that every time you make a to-do or grocery list, start with a couple of things you are grateful for. Most of this are things we know but a good reminder never hurts! We can do it! By the way, the only resolution I've ever made and kept was one I made with Chris. It's a great one and completely made me a happier person. BE NICE! It's surprising how easy this is and how much it makes a difference in your life. I do slip up and just need to remind myself every once and a while . . .
Y'all, these chicken nuggets have been a huge hit with my kid! And I love them because they can be made quickly from regular, boneless, skinless chicken breast... including leftover chicken from a previous meal! So, unlike many chicken nuggets out there, I know exactly what's in them. Why are these so popular with my meat-averse child? I think it's because of the smooth texture (the chicken is pureed in a food processor first) and the tang of flavor (from the butter/dijon/worcestershire coating.) 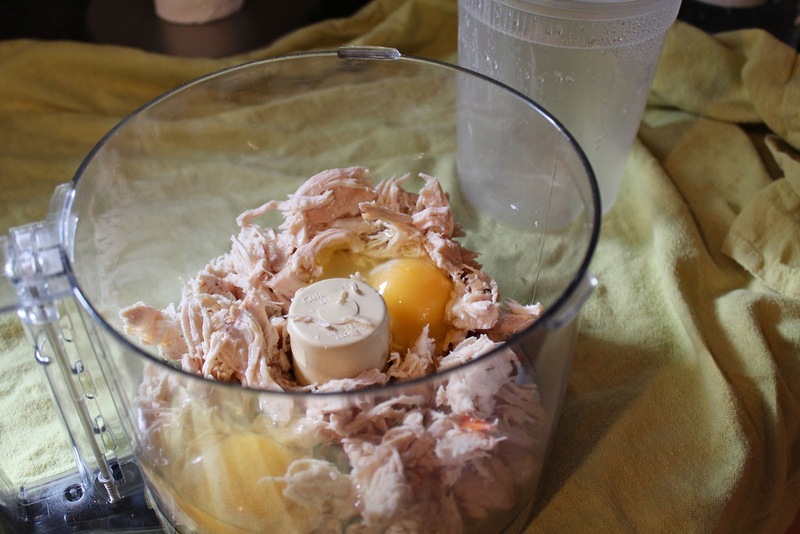 I am so grateful to Amy over at Healthy Meals for Healthy Kids for introducing me to the method of pureeing the chicken in the food processor - I never would've thought of this! I took her original recipe and built on it to give the nuggets a bit more flavor. Plus, her recipe calls for 1 boneless skinless chicken breast poached in boiling water for 10 minutes. While this is a healthy and easy way to prepare the chicken, I wanted to see if the recipe works with leftover chicken cooked various ways. And... it does! I have made these several different times with chicken breast slow-cooked in my crock pot and even sautéed in some olive oil. So, as I mentioned, my 2 1/2 year old loves these (especially when I serve them with a 'dipping' sauce.) My husband and I like the way they taste, but I have to be honest: the pureed chicken texture does make them seem like "toddler" food. So, he and I have eaten them, but it's not our favorite way to have chicken! The good news: once the chicken is cooked, the nuggets only need about 10 minutes in the oven. One night recently, I made Mediterranean Chicken for the grown-ups, and turned the same chicken into nuggets for WP. 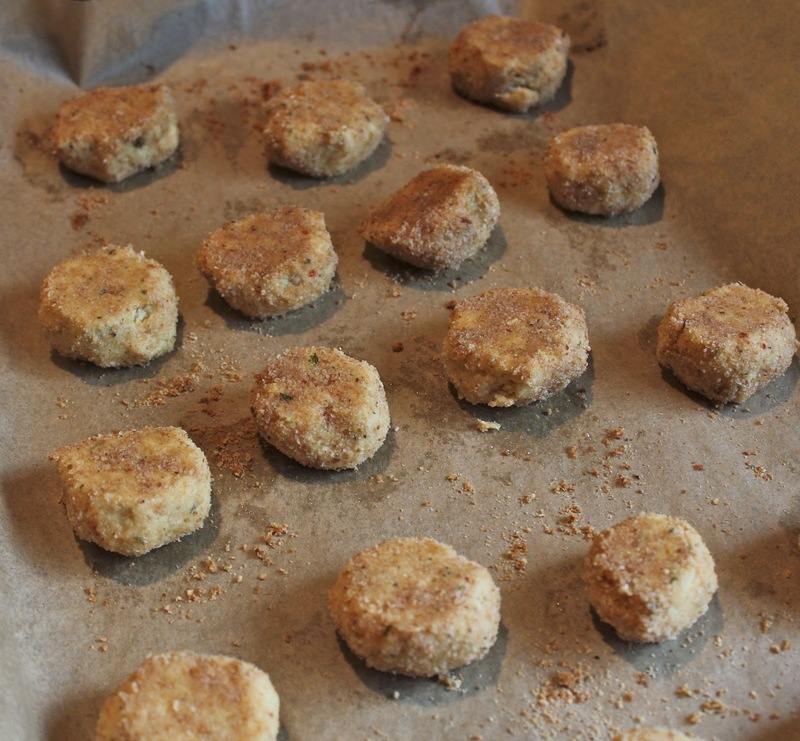 It was a bit of extra work, but the nuggets have kept well in the fridge. Add the cooked chicken, egg, and salt to the food processor and pulse until smooth. In one bowl, combine butter, Dijon and Worcestershire sauce. 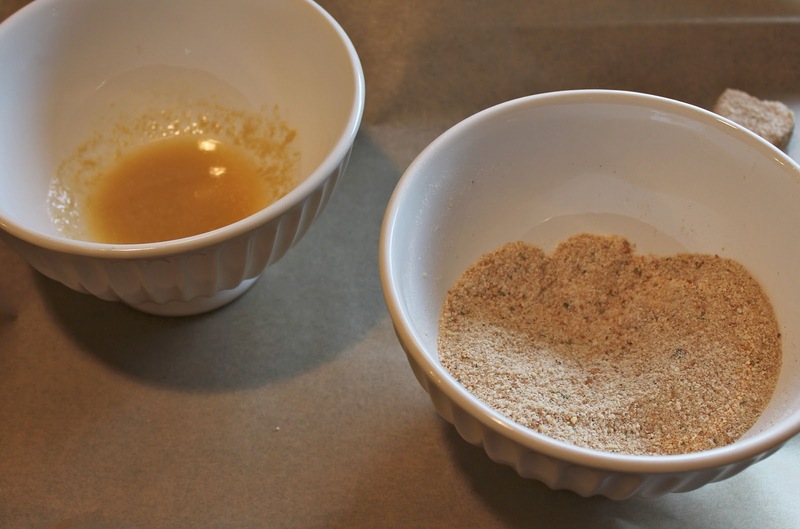 In another bowl combine breadcrumbs and seasoning (optional.) Dip each nugget into the butter mixture, then coat with the breadcrumb mixture. Place nuggets on a parchment or foil lined baking sheet. Bake at 400 for 10 minutes. 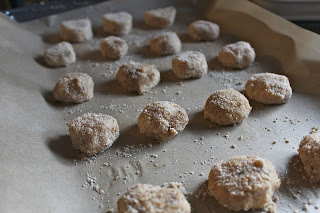 If your family likes these, they will probably love Kim's Yummy Chicken Balls (I'm resisting the temptation to make a "Schwetty" joke here) and Oven Baked Chicken Parmesan. Yep. You read correctly. Individually packaged Dora Edamame: a healthy snack with kid-friendly packaging. Hallelujah! 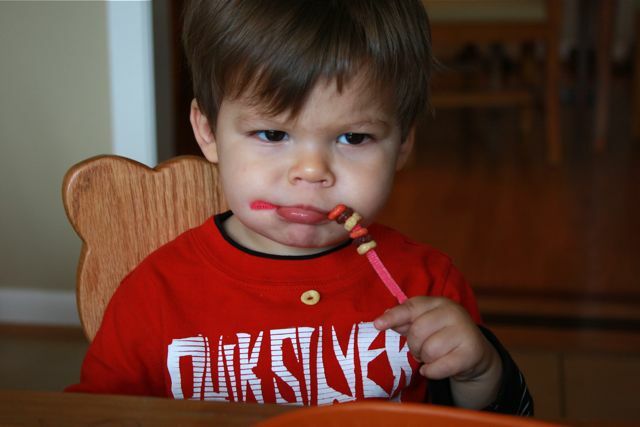 I am amazed at how susceptible my 2 1/2 year old is to marketing. He knows and loves lots of cartoon characters, many from shows or movies he has never even seen! And he is especially drawn to them any time he sees them on a grocery store shelf. 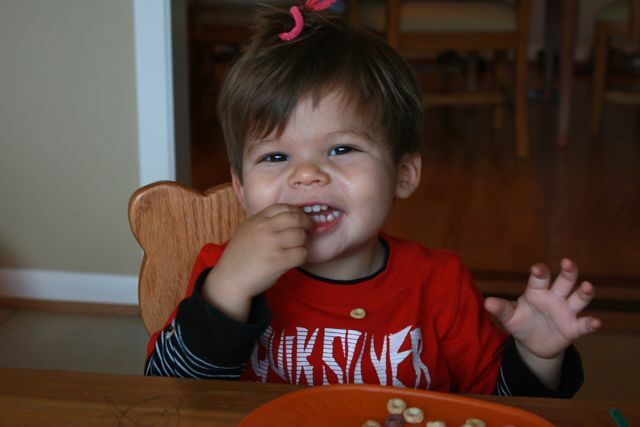 He always wants Cars crackers and gummies, Thomas the Tank Engine Pasta, and Sponge Bob yogurt (just to name a few.) I'm sure you know the feeling! So, you can imagine my excitement when I found this Dora Edamame at Whole foods. They are individually packaged in 8 1.5 oz packages. They stay in the freezer, and the edamame simply needs to be defrosted before eating. 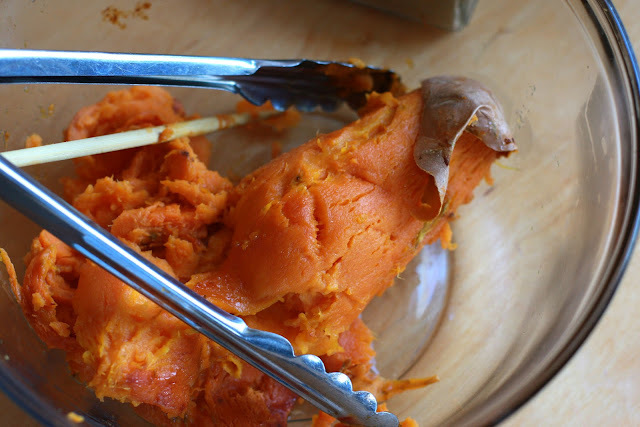 They can defrost in less than a minute in the microwave, or by removing them from the freezer for a few hours. They are perfect to send in a lunch! 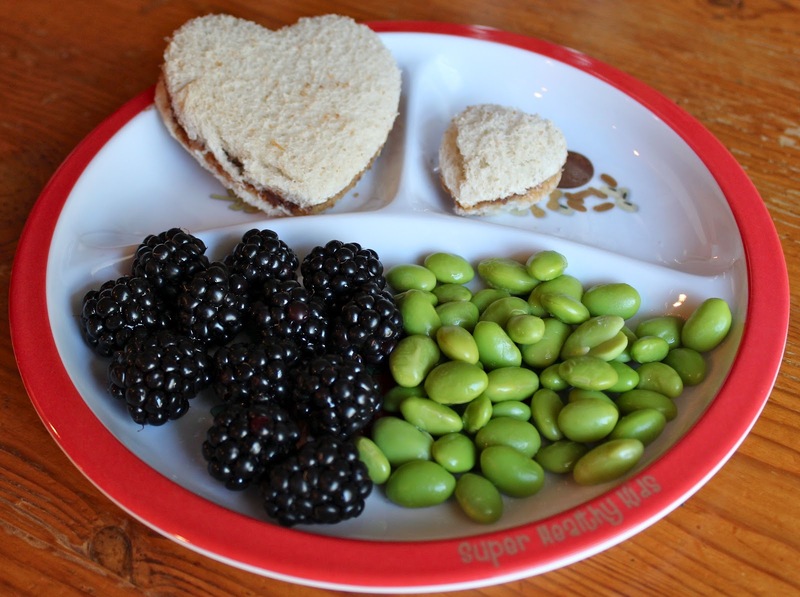 Edamame is one of my favorite snacks (tasty, convenient, high in protein, and low in fat.) I've let WP try edamame before, but he has never devoured it like he did this Dora stuff. He ate two whole packages the day I brought it home, and he kept calling it "Dora Pasta" and "Dora Beans!" The kid was pumped up about this! Admittedly, Dora and Boots are two of his very favorite characters (he was Boots the monkey for Halloween.) 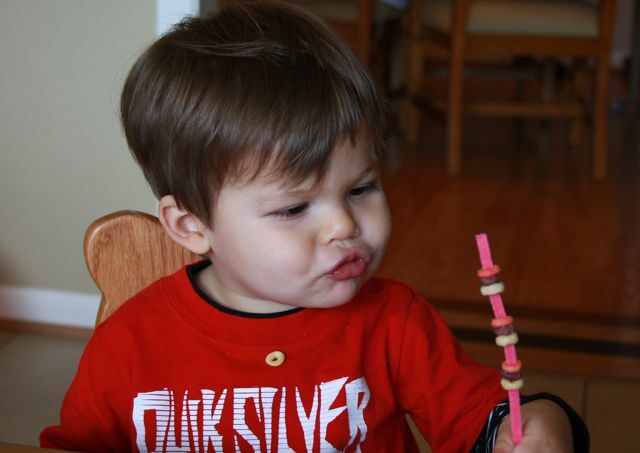 I think he would eat anything in Dora packaging. Does your kid have a favorite character? 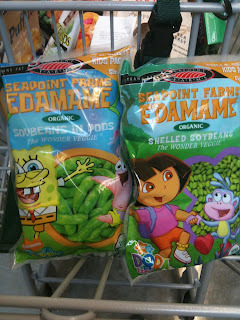 If you can't find this Dora or Sponge Bob edamame, try and create your own fun packaging that will appeal to your kids. Look for treat bags or party favor bags with their favorite character, pre-fill them with healthy snacks, then stash them in the fridge or pantry and watch little eyes light up at snack time! 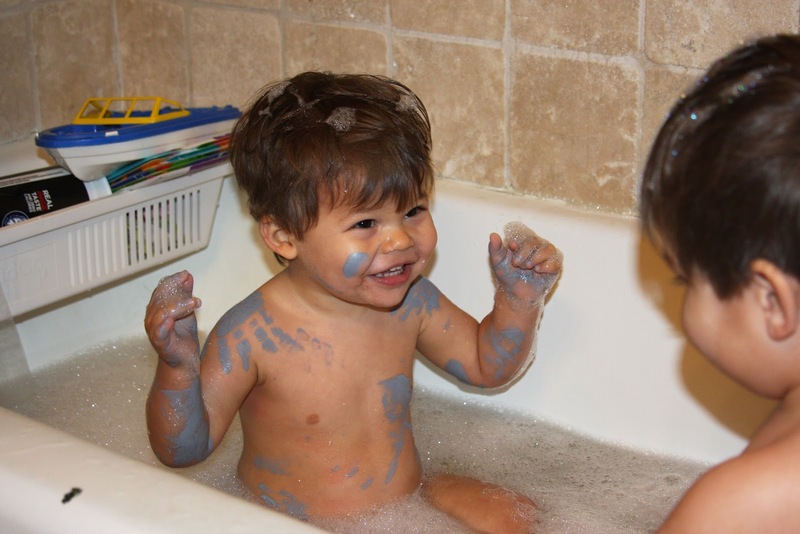 KD won't really sit down and color in a coloring book; his 1 year old brother will, but he refuses. He did love the popsicle game Lauren posted about a couple of weeks ago, matching the colors and putting them together. 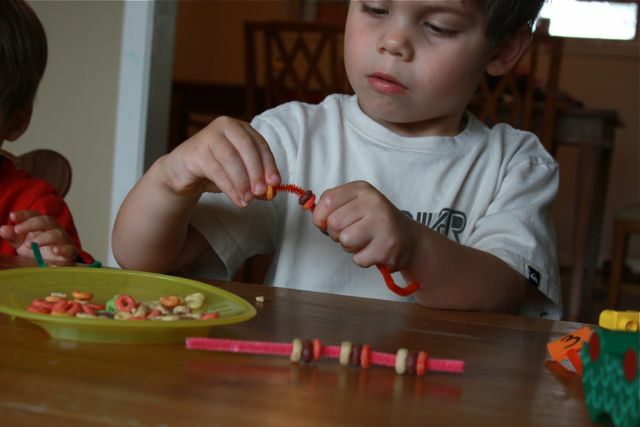 So, I've been on the lookout for similar activities that may get him to focus for more than a minute. 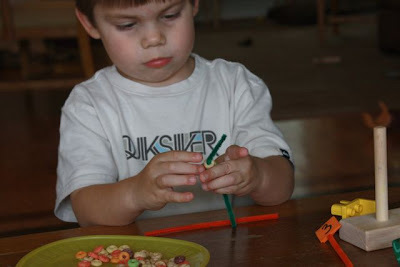 When I saw the idea of numbers on pipe cleaners on Pinterest, I thought that it was so simple and great and may actually hold his attention like the popsicles. Adding color to this activity opens the door to more activities at different levels. I am using the Fruity Cheerios (taste and smell just like Fruit Loops- I'm not sure what the difference is beyond size) and some regular Cheerios. While I was setting this up, I made a few patterns with the colors just to see if he could recognize 'what comes next'. He didn't, but I think that in the future it would be a fun twist to add on. He does know his numbers and colors and had a great time matching those. 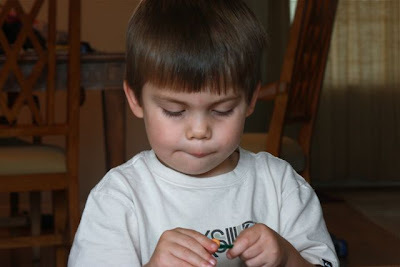 I love his face when he's focusing . . . 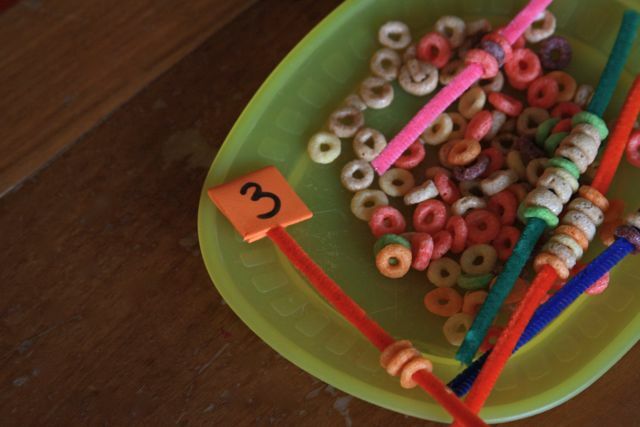 I did have to make the rule that he could only eat them off of the pipe cleaners- which kept him sitting for a bit longer! KC enjoyed eating them . 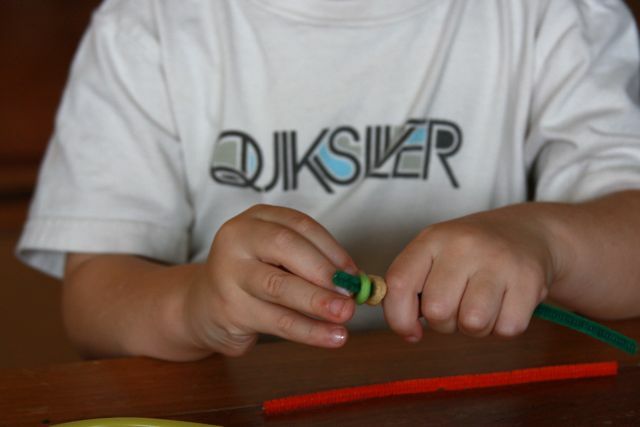 . .
And playing with the pipe cleaners. Nice hat! Bananas Foster Oatmeal - tastes like dessert for breakfast! Also... I just signed up for Weight Watchers online. (My son is 2 1/2 - I can't still call this "baby weight"!) I'm still learning their Points Plus system, but I will try to include points in recipes where I have figured them out. 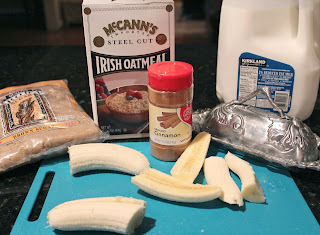 For the oatmeal: I love steel cut oats, but since they are heartier than quick cooking oats, they take much longer to cook. I never have 45 minutes to prepare them in the morning, so I use a shortcut that begins the night before: boil 4 cups of water in a pot. Add 1 cup steel cut oats and simmer 1 minute. Cover pot and store overnight in the refrigerator. 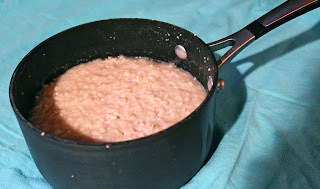 The next morning, cook the oatmeal on low for about 10 minutes, stirring occasionally. (You can even keep leftover oatmeal in the pot, store it back in the refrigerator, and re-heat on the stove the next morning.) Honestly, instant or quick cooking oatmeal would make a fine substitute here. Use whatever oatmeal your family likes. While the oatmeal warms/cooks, prepare the Bananas Foster Topping. 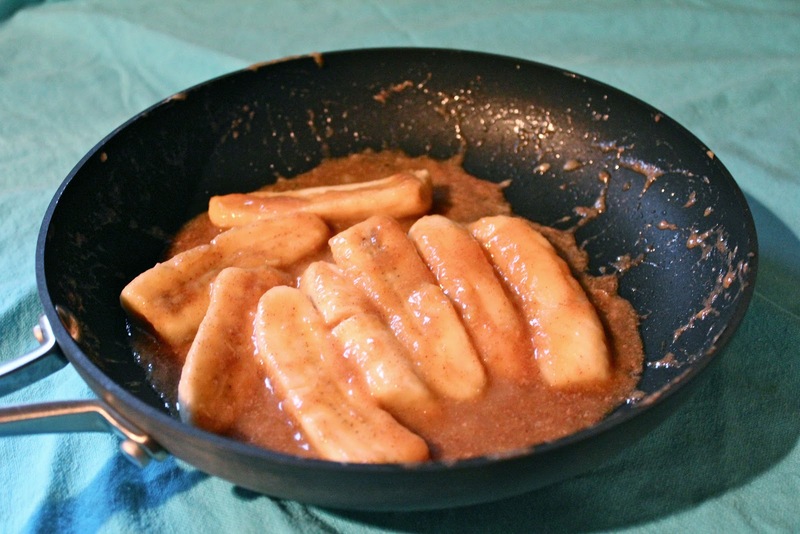 For the Bananas Foster Topping: Combine the butter, sugar and cinnamon in a skillet. Place the pan over low heat and stir until the sugar dissolves. Stir or whisk in the milk until the mixture is thoroughly blended. 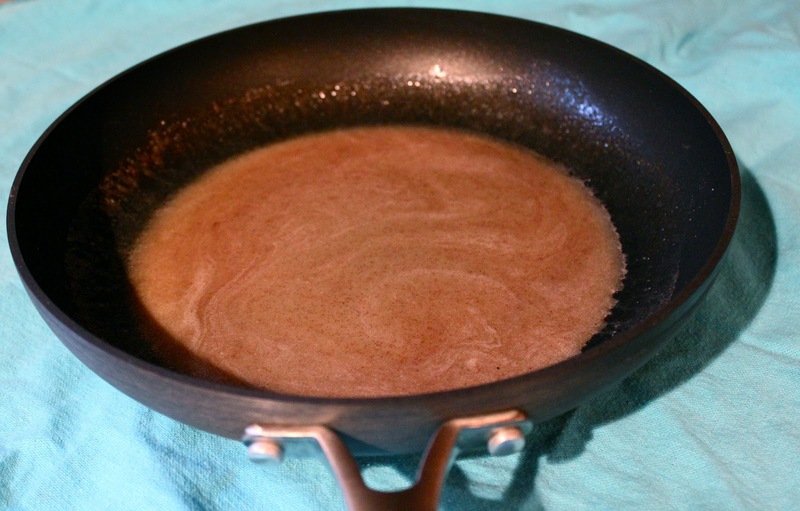 You will want a smooth, slightly thickened, caramel colored mixture. Place the bananas in the pan and cook until the bananas soften and begin to brown, about 5-7 minutes. 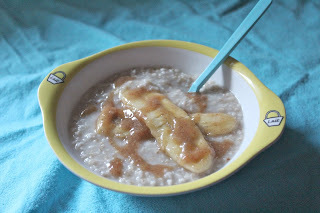 Note: WP prefers his Bananas Foster Topping mixed into the oatmeal. He also prefers instant oatmeal - I think the texture of the steel cut oats is ‘different’ than what he expects from oatmeal. Toast the bread in the toaster. 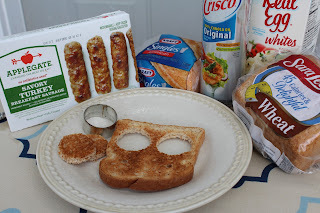 Turn the toast 'up-side down' and use a small circle-shaped cookie cutter to cut out the eyes (and save the cut-out circles!) Heat a skillet over medium-high heat and spray with cooking spray. Add the toast to the skillet and pour egg whites into the holes. 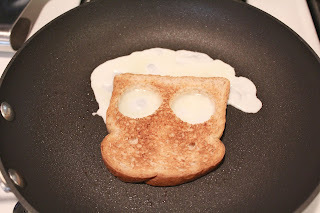 After a couple of minutes, when the egg whites have 'set', remove the toast and eggs from the pan. 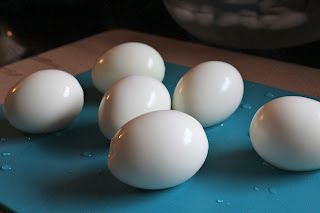 Trim any egg white run-off. Add slices of turkey sausage rounds to the eyes and cut out a diamond of American cheese for the beak. 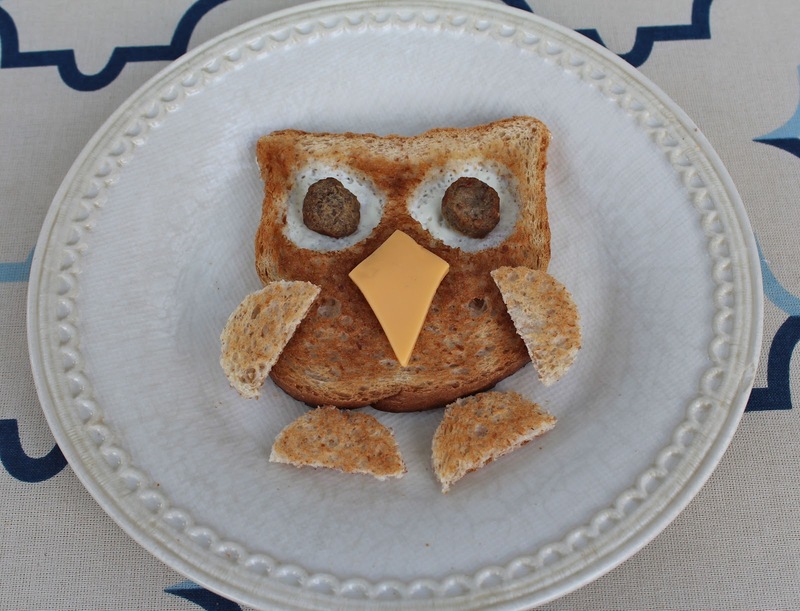 Cut each of the toast circles (from the eyes) in half and use the semi-circles for wings and feet. 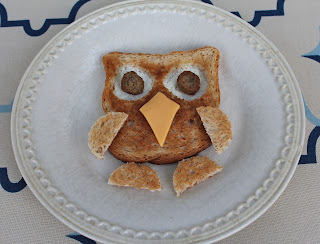 Owl Toast! If the toast is flat against the skillet, there shouldn't be any 'run-off'. Mine obviously wasn't, but I just trimmed it off before serving!